It’s nice to see the good guys win. And Alfonso Ribeiro is a good guy. We’re not best friends or anything, but after getting a chance to watch him both behind the scenes and in front of the camera and then getting the opportunity to interview him one-on-one, I feel like I can say with confidence that Alfonso is a good guy. Which I believe is also the key to his success. There is a genuineness about him that comes through whenever you talk to him. On screen he has a very polished “host” personality with the perfect intonation and great rhythmic sound, but still manages to reflect the good guy within. Off screen and in person he’s relaxed, engaging, and seems like the kind of person you’d enjoy hanging around with. It’s obvious he cares deeply about everything he does, whether it’s the show or being with his family. His wife Angela wrote in her blog that Alfonso is a great dad and has probably even changed more diapers than she has! It’s hard not to root for a guy like that. So it’s been fun watching him to do so well as he adapts to his new role as host of ABC’s longest running primetime show, America’s Funniest Home Videos or AFV for short. I got the opportunity to talk with him about the show and he was very gracious. 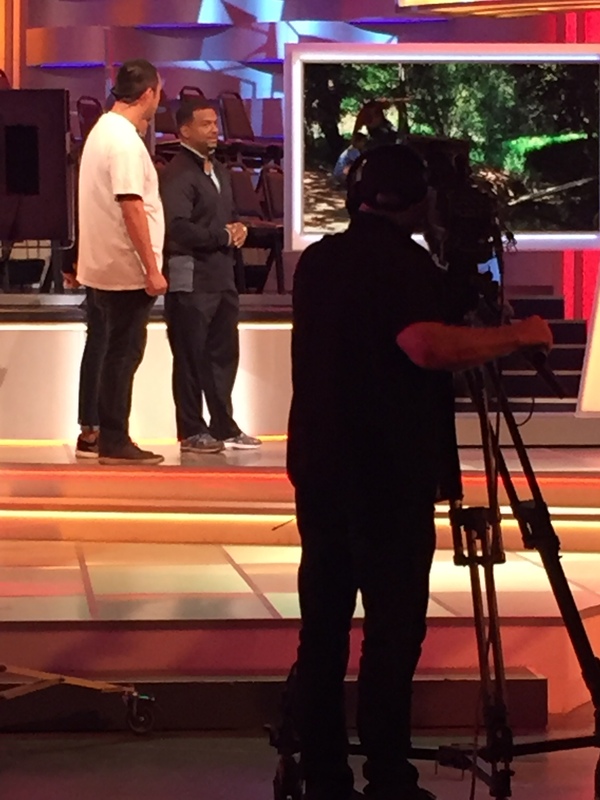 Me (and all the rest of the audience) sharing a moment with Alfonso as he announces he will be doing The Carlton on the show. Can you find me? I was actually at the taping for the show that’s about to air on Sunday night and had the privilege of doing The Carlton Dance with you as a member of the audience, so thank you for that. Yeah, that was a lot of fun! I believe you mentioned on the show that you were bringing the dance out of retirement one last time. Will this really be the last time we see The Carlton Dance? You know I can never say it will never happen again because that’s impossible to say. I kind of feel like a boxer coming back into the ring. Sort of like George Foreman where it’s always the last fight until the next one comes along. Who knows? I might be 60 and decide to do it again one more time. What about the dance do you think has connected so strongly with people? I think ultimately people have a connection to their childhood through things like this and they develop good memories about it. Most of them grew up with Fresh Prince of Bel Air and grew up with that show so the dance connects them to those memories. Anytime they see it, do it, or hear about it puts smile on their face so I think it gives them a connection to those good memories from their childhood. Dancing has been a big part of your career, from the Michael Jackson commercial to the Carlton to Dancing With the Stars, but you actually starred in the Broadway musical The Tap Dance Kid. One of my early gigs. I actually started acting before that, but it was one of my first big break out performances. The crazy thing is I’ve been connected to dance for four decades, but I’m not a dancer. The only kind of dance I was trained in was tap dancing. Everything else was just because I had good rhythm and body control and body awareness. I never went to a dance academy or any of that. I think it’s illustrated best whenever I do the Michael Jackson steps. I do them backward. That’s because I was mirroring them on TV. I’m a very visual learner. It was like that on Dancing With the Stars. I would focus on it by learning visually. When I was on the show people would say “You’re a dancer! That’s not fair!” And in my head, I was like, “Thank you for thinking of me that way.” It meant I was doing a good enough job pretending to be that way that they thought I had formal training. But I hadn’t. Would you like to do more acting on Broadway eventually? You know, I’ve talked about this. With family and my career the way it’s going, it’s impossible to actually do it in the near future. But one thing we have talked about is going on tour with Dancing With the Stars again. We absolutely loved being out on tour with them. It was such a great feeling. And of course, performing every night for a live audience was thrilling. Each night was always different, so I would love to do that again. But performing on Broadway is something I would think about in my future. Just not now with where I’m at. 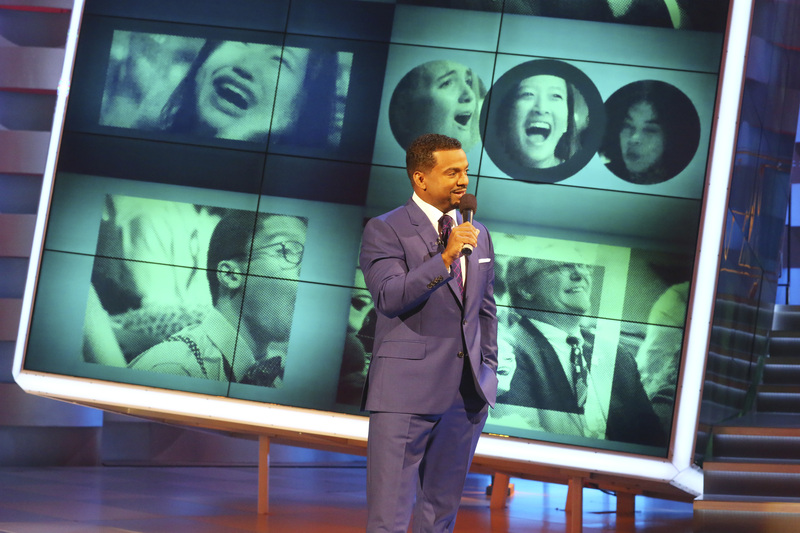 AMERICA’S FUNNIEST HOME VIDEOS – “Episode 2601” — (ABC/Michael Ansell) ALFONSO RIBEIRO hosting the season premiere. 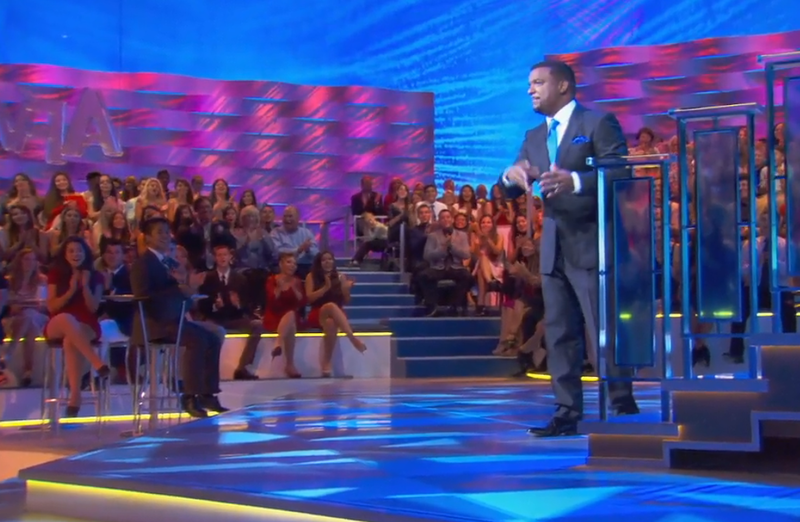 Going back to AFV, how did you get tapped to be the host? Did it have anything to do with your connection to Tom Bergeron and Dancing With the Stars? It was actually a connection with ABC. After Dancing With the Stars was over, I had met with one of the heads of the company and he said to me, “What do you want to do?” And I saw this picture of Tom on the wall and said, “I know that Tom’s leaving (AFV) and I’d love to do that show.” It’s not that I would ever want to take anybody’s job. I’d never want to do that. I’ve been around long enough and seen it happen that I wouldn’t want that at all. But since he was leaving, I thought that was the perfect show for me. And they said, “That’s actually the show we want to talk to you about.” Tom chimed in and said, “If there’s someone taking my place. My vote would be with Alfonso.” And that meant the world to me. We became friends on Dancing With the Stars. But even before then, Tom has always been my favorite host on TV. He’s truly the best. It’s kind of crazy to be following him. The day I was at the taping, you did a great job as host – not just on television but with the audience. You really interacted with us and answered questions. Do you often answer questions from the audience during tapings? I feel like it’s important to keep the audience engaged. You want them there the entire show. They are a member of your cast each week. I think about it this way, if you were hosting a show and they were a guest on your show, would you not talk to them? Of course you would! It’s important to talk to them, to make them really be a part of the show because they are. I love people. I love being around people. If I’m spending five minutes standing there, why not answer a few questions. It’s about being connected, being a real person, and I enjoy connecting with people. Thanks so much for the time Alfonso and blessings to you and your family in the course of this new adventure. I really appreciate it! Thank you! And I hope you’re readers will tune in and enjoy the show. Be sure to tune in every Sunday for more America’s Funniest Home Videos wackiness at 7pm and see Alfonso as host of the show. And this Sunday if you tune in (11/8) look for me in the audience and you just might catch a glimpse of me or more! You can follow Alfonso on Facebook as well as AFV. You can also go to AFV’s homepage on their website for more information about the show. To read more about behind the scenes at AFV, make sure to read our blog post about it.